189 Beacon is located on the south side of Beacon, between Berkeley and Clarendon, with 187 Beacon to the east and 191 Beacon to the west. Click here for an index to the deeds for 189 Beacon. On September 29, 1870, 189 Beacon was purchased from Henry Whitwell by Henry Rogers Dalton and his brother, Dr. Edward Barry Dalton. They previously had lived at 18 Brimmer. Henry Dalton was an insurance broker. He was a widower, his wife, Elizabeth (Russell) Dalton, having died in December of 1869. Edward Dalton was a physician and also was a widower. He had practiced in New York City until the Civil War, when he volunteered as a surgeon and served from April of 1861 to May of 1865, his last post being medical director of the 9th Army Corps. During the war, he developed a special ambulance with suspension systems to protect the injured. In March of 1866, he was appointed sanitary superintendent of the New York City Board of Health, where he developed the city’s first ambulance system. He resigned in January of 1869 and, following the death of his wife, Sarah (Colburn) Dalton, in July of 1869, he moved to Boston to begin practice there, living with his brother at 18 Brimmer. Henry Dalton married again in January of 1872 to Florence Chapman; after their marriage they lived at 288 Marlborough. Edward Dalton was in ill health and went to Santa Barbara, California, where he died in May of 1872. On May 2, 1872, shortly before Edward Dalton’s death, 187 Beacon was purchased from the Daltons by attorney George Abbot James. He and his wife, Elizabeth Cabot (Lodge) James, made it their home. She was the sister of future US Senator Henry Cabot Lodge. They previously had lived at 31 Beacon. They also maintained a home in Nahant. George and Elizabeth James continued to live at 189 Beacon during the 1881-1882 winter season, but had moved to 8 Mt. Vernon Place by 1883. On August 19, 1882, 189 Beacon was purchased from George James by Sidney Williams Burgess, a shipping, yacht, and insurance broker. He and his wife, Alice Brastow (Thayer) Burgess, made it their home during the 1882-1883 winter season. They previously had lived at 253 Beacon. By the next season, they were living at the Hotel Oxford (southeast corner of Exeter and Huntington). During the 1883-1884 winter season, 189 Beacon was the home of Mrs. Elizabeth Boardman Ingersoll (Bowditch) Dixwell, widow of banker John James Dixwell, and their son, Arthur, a noted baseball aficionado who established the Dixwell Trophy. They maintained their primary residence in Jamaica Plain. On April 1, 1884, 189 Beacon was purchased from Sidney Burgess by Mary Louise Bangs and her sister, Frances E. Bangs. They previously had lived at 62 Chestnut. Frances Bangs died in December of 1891. 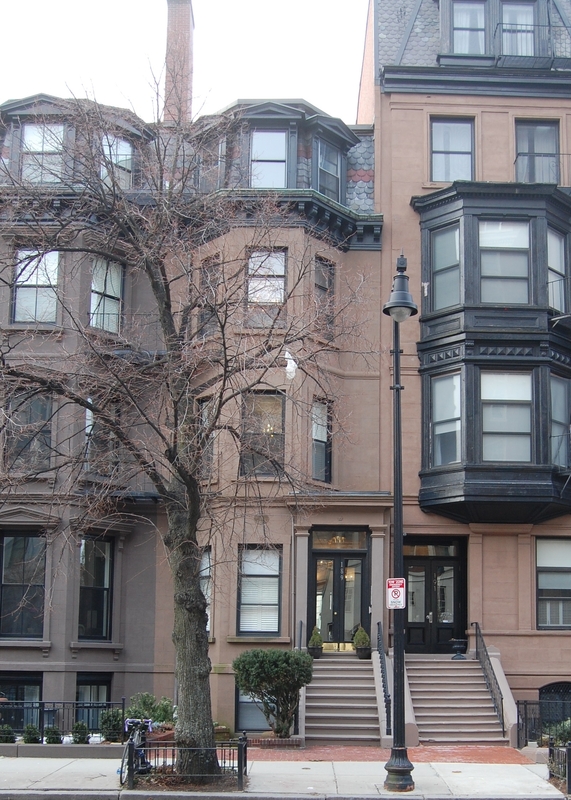 Mary Bangs continued to live at 189 Beacon during the 1894-1895 winter season, after which she moved to an apartment in The Chesterfield at 371 Commonwealth. On March 28, 1895, 189 Beacon was purchased from Mary Bangs and the estate of Frances Bangs by Dr. Charles Locke Scudder. He was a surgeon and also maintained his office there. He previouusly had lived and maintained his office at 1 Marlborough. On April 5, 1895, Dr. Scudder transferred 189 Beacon to his mother, Sarah Patch (Lamson) Scudder, the widow of Evarts Scudder. In September of 1895, Charles Scudder married to Abigail Taylor Seelye. After their marriage, they lived at 189 Beacon and, on March 18, 1896, his mother transferred the property to Abigail Scudder. The Scudders continued to live at 189 Beacon during the 1908-1909 winter season, but moved thereafter to 209 Beacon. On October 4, 1909, 189 Beacon was acquired from Abigail Scudder by Alanson Bigelow, Jr., trustee under the will of his grandfather, Abraham Orlando Bigelow, to be the home of Abraham Bigelow’s daughter, Helen Olivia Bigelow. In 1905, she had lived at 217 Beacon with her widowed mother, Olivia (Dodd) Bigelow, who died in December of that year. Helen Bigelow continued to live at 189 Beacon until her death in March of 1923. In a series of transactions from May through July of 1923, 189 Beacon was acquired from the estates of Abraham Bigelow and Helen Bigelow by Robert F. Wilkins, an insurance broker. He and his wife, Florence (Dillon) Wilkins, lived in Dorchester. On December 11, 1923, 189 Beacon was acquired from Robert Wilkins by real estate and insurance broker Robert Elmer Townsend. He and his wife, Josephine (Wheildon) Townsend, made it their home. They previously had lived at 3 Plymouth. They also maintained a home in North Falmouth. Robert Townsend died in September of 1941. Josephine Townsend continued to live at 189 Beacon. Their son, Robert Elmer Townsend, Jr., a real estate and insurance broker in the firm founded by his father, lived with her. He was unmarried. In about 1948, Josephine and Robert Townsend, jr., were joined at 189 Beacon by Stanislaus Czuczwa, a chemist, and his wife, Irene (Polaski) Czuczwa. Josephine Townsend died in October of 1952. Robert Townsend, Jr.. and the Czuczwas continued to live at 189 Beacon. Robert Townsend, Jr., died in July of 1959, and Stanislaus and Irene Czuczwa moved to Waltham soon thereafter. On April 5, 1960, 189 Beacon was acquired from the estate of Robert Townsend, Jr., by June Augusta (d’Augusta), an interior decorator. She previously lived in Lexington. During her ownership, the occupancy of the property was increased, without Building Department approval, from a single-family to a multiple dwelling. In January of 1971, she married to Jon Z. Allyn. On April 11, 1973, 189 Beacon was acquired from June Augusta by James C. Lawless and and his wife, Christina H. Lawless, trustees of the Lawless Realty Trust. In May of 1973 they filed for (and subsequently received) permission to legalize the occupancy as nine apartments. 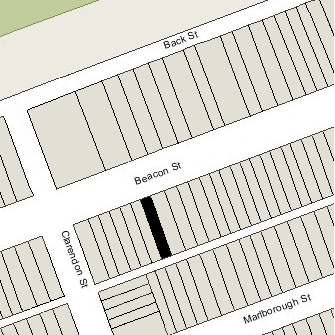 On June 1, 2005, 189 Beacon was acquired from James and Christina Lawless by Jeffrey M. Stitt, trustee of First Beacon Real Estate Trust, and on June 30, 2005, it was acquired from him by the 189 Beacon Street LLC (Marcia F. Sassoon, manager of record). 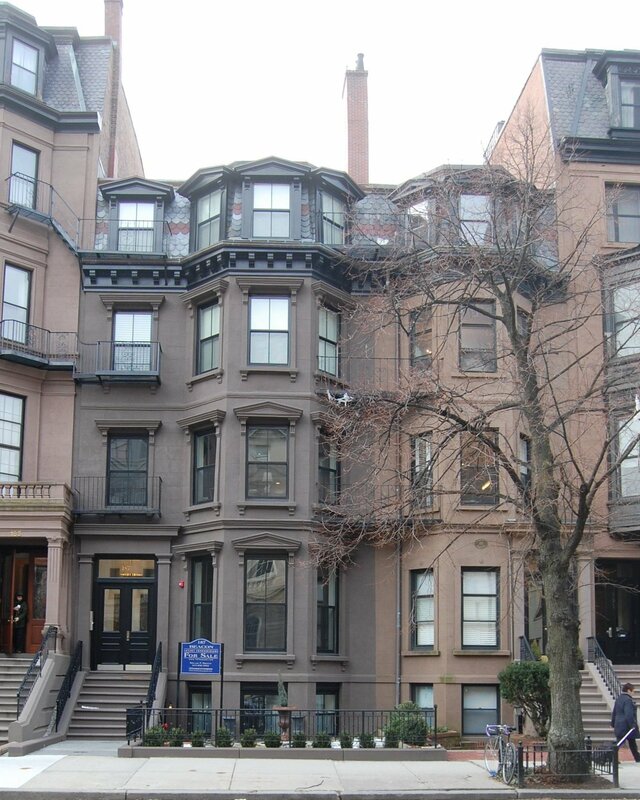 In September of 2005, the 189 Beacon Street LLC filed for (and subsequently received) permission to change the occupancy from nine units to seven units, and on January 17, 2006, it converted the property into seven condominium units, The Franklin Residences Condominium.